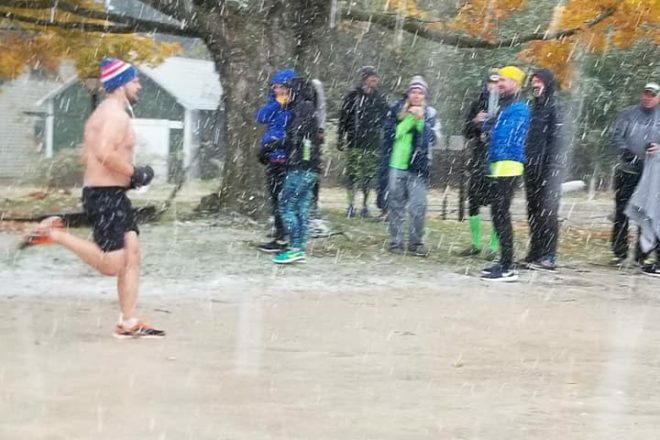 One runner was not impressed by Mother Nature at Saturday’s Fall 50. Submitted. The rain came, followed by sleet, which turned into snow, which was whipped into faces by wind gusting up to 40 miles per hour. Yet somehow through all of that, 63 solo runners still completed the 2018 Door County Fall 50 Saturday, Oct. 20. Founder Sean Ryan said it was the worst conditions in the history of the race, and it even put power lines down on the course in the late afternoon. Yet hundreds of relay teams gutted it out and completed the race from Gills Rock to Sturgeon Bay and stuck around to celebrate in two massive tents at Sunset Park. No finisher was faster than Nick Coury, who completed the race in 6:00:50. That’s a 7:13 pace, for 50 miles in terrible conditions. Benjamin Orvold took second in 6:14:09, and Mark Jasper was third in 6:15:30. Carolyn Smith returned to win her second straight Fall 50 in a time of 7:12:11, healthily outpacing second place Jessica Lemere, who clocked in at 7:52:28. The participants were not the only ones dealing with tough conditions. A dozen volunteer groups and medical personnel from Door County Medical Center staffed aid stations on the route, toughing it out in the cold and snow to keep runners going. Tents took a beating in the wind, but nobody went home early. With 505 teams joining the solo runners, the race brings about 2,500 participants to the peninsula. The Fall 50 raises more than $30,000 for Door County charities each year.